As soon as they received their pints, the four men wearing outdoor gear at the bar — looking barely old enough to be ordering beers — meandered their way through the floor to get to the Drake's basement stage. Once the drinks were sitting safely, the guitar straps tensed over their shoulders, the drummer struck a couple of hits to prompt the rest of Liss into immediate action. Lately, the Aarhus-based foursome have found themselves on the tip of some prominent tongues (even Pharrell Williams) thanks to a compact slate of rhythmic, intoxicating R&B jams that simultaneously provoke a tapping foot while the heart sinks a little. Releasing their first EP on the stellar XL Recordings, First delineates the most concise statement so far, so it was unfortunate that fewer than 30 people found their way to the discreet elegance of the Drake's basement, complete with art deco finishings and little lighting effects that popped to the blissfully funky bass lines. The band were in fine form, offering selections from their EP as well as some sultry unreleased songs that were drenched in lusty rhythmic tones by the bassist, Villads, who jerked moderately with every chord pluck. The group consists of four stable members, fulfilling conventional rock band roles, but the addition of a travelling producer on an MPC emphasized the digital grandeur of their sound through layered effects. Samples used on "Try" brought lots of colour to the prism the broken guitar chord hinted at. Echoing percussive samples, like trickles and tooting birds, briefly made appearances elsewhere. Frontman Soren Holm, the young man with a voice that freewheels through throws of emotional expulsion, acted as the cohesive element of a band that seems a little too focused on their individual tasks instead of feeding off one another's energy. But still, their latest single "Miles Apart," dropped midway through the set, found Liss locking into the catchiness that's made their name so far, with a heavier spreading of synth loops to go along with the typically breezy groove. "Sorry," the tearful closer to their set, allowed Holm to slink between the swooning voids between bass notes, but he also pitched his voice high up for the song's bridge. There were hints of Prince in the song's performance, but also reminders of Jamiroquai in the funky staggering to Holm's style. 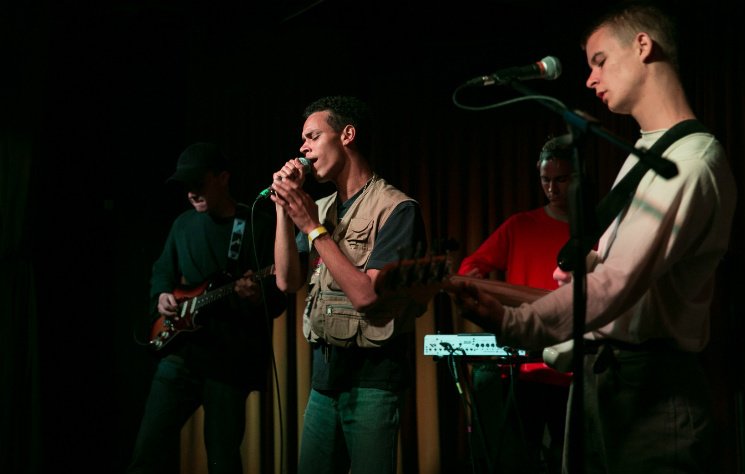 Despite tons of promise, and an already satisfying performance style, Liss give a sense that they're still in the learning process, and given the mounting interest, that unfamiliarity to touring and being the centre of attention should reshape their live personas over the next few years. Next time, those humble boys standing at the bar are going to blow us away.